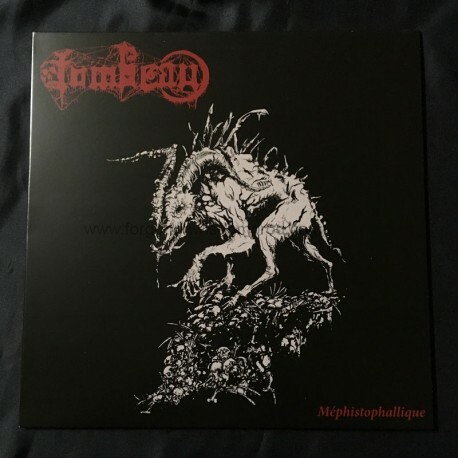 With this vinyl reissue of Tombeau’s 2013 demo, “Méphistophallique,” Nuclear War Now! once again showcases the fertile metal breeding ground that is Quebec. Although the region had historically been more known as an incubator of futuristic thrash metal (e.g., Voivod), more obscure evil speed/thrash (e.g., Voor, Soothsayer, Yog Sothots), and technical death metal (e.g., Gorguts, Cryptopsy), in recent times it has garnered attention for its black metal scene. However, while Tombeau may indeed share some basic foundational elements with those typically considered to form the pillars of the “Metal Noir Québécois” sound, the band’s output could perhaps be described as being considerably more primeval. In fact, Tombeau shares much more in common musically with the death-infused black metal of Demoncy than it does with its regional contemporaries. Among other similar themes, Tombeau’s lyrical content explores the painful gestation and birth of the ultimate evil, which is perfectly reflected in the agonized vocal delivery. While the original demo cassette was limited to only 100 units, this 12” vinyl reissue, mastered at 45 RPM for optimal sound quality, aims to propagate the rebirth of said evil.